Hojicha (roasted green tea) ice cream is one of my favorite ways to enjoy the warmth of summer. It’s extremely nutty and aromatic。And because of that, the emulsified ice cream base is well-suited to carry all that flavor straight to your mouth. You can serve this on it’s own, or with whipped cream, either way it’ll make for a refined and semi-sweet dessert. Need a new ice cream recipe? For me this is an oldie but a goodie. Not only because I love tea, but because it tastes delicious and has a healthy ingredient – hojicha tea!! 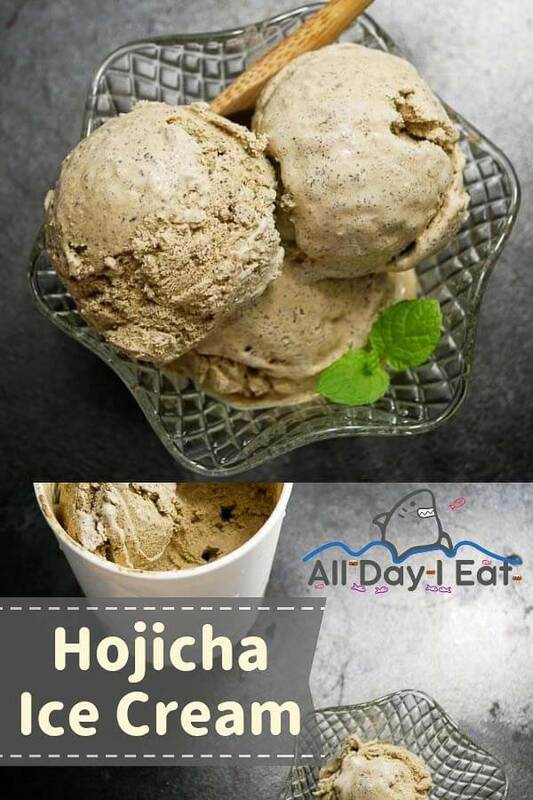 In case you were wondering, hojicha ice cream is made with hojicha tea – roasted green tea. In Japan, hojicha tea is often served with sweets or after a meal. It’s a nice way to clean the palate. And it’s another good way to get more healthy delicious tea into your routine. Hojicha is quite low in caffeine, so you can drink or eat this at night without fear of being unable to sleep. It’s super earthy and has a wonderful aromatic character. It can even be consumed hot or cold! Since it’s summer I’m definitely drinking a lot of cold teas! It’s flavor is robust enough that it can be used in sweets ranging from baked goods, to soft serve and ice cream. 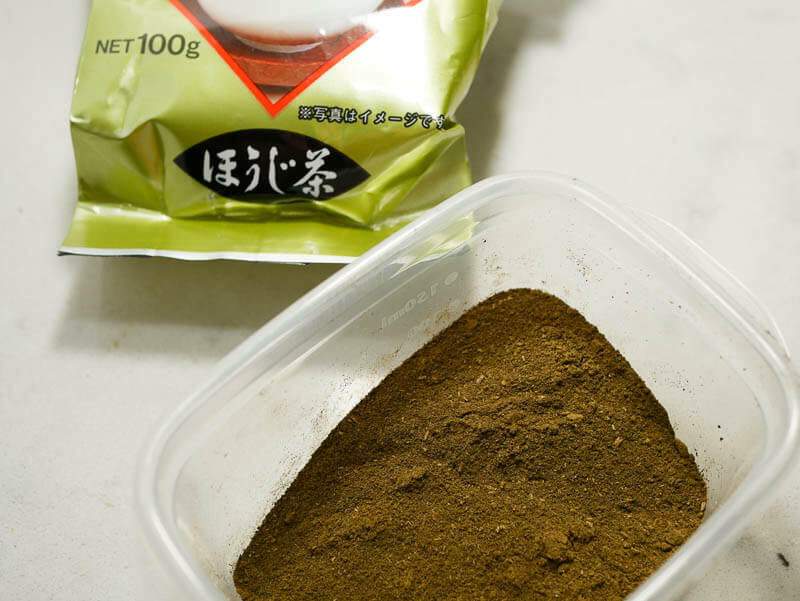 Whether you drink or eat hojicha, you’ll likely find it in loose leaf or tea bag form. There’s also a powdered version, which if you’re lucky, can save you a step below. But I haven’t come across it in the US. So for today’s ice cream, we’ll be processing the hojicha leaves into powder! At a high level, we’re making a milk tea base that we’re sweetening with sugar. Then we’ll rapidly cool the mixture in cold cream before churning. If you’re starting with loose leaves, you’ll need to make a decision. To powderize or leave whole. I use my food processor to powderize the loose leaves. You want the processed leaves as fine as possible. See the processed hojicha above? If you use the hojicha leaves whole, you can just steep and then strain them out. To ensure complete extraction of flavor, you’ll need to steep the whole leaves a bit longer than if you were using the powder. For this round, I wanted to try something different and left the powdered bits in the final ice cream product. If you use the powder, the way I usually strain it is with my nutmilk bag. So you may be wondering… how was it? It adds a little texture, which can be good or bad, depending on your preferences. Either way, whole leaves or ground, this is a refreshing ice cream that’s not overly sweet. I use the same ratio of sugar to cream milk as I do in my other ice cream recipes. 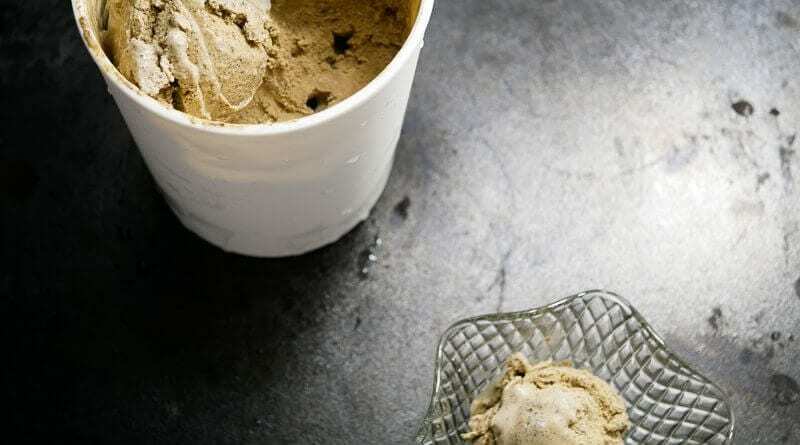 The good thing with making ice cream is that you can always taste it before you churn. So while the base is still warm, if you find it’s not sweet enough, you can always add more sugar, but you can’t take it out! 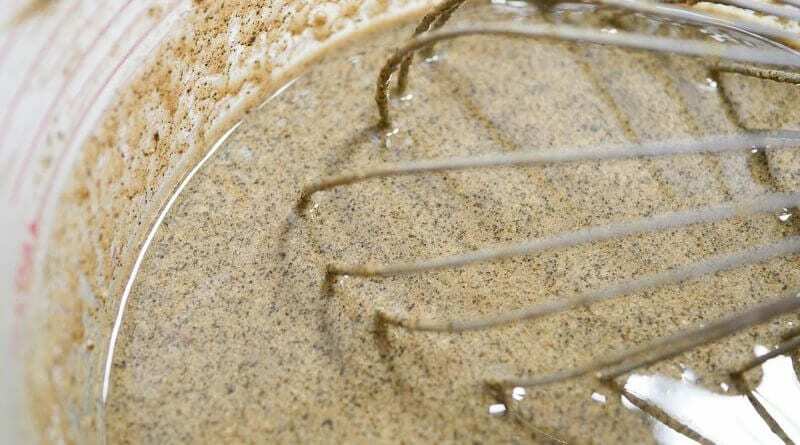 Here’s how the powdered hojicha looked after processing and mixing in to the base. If you use whole leaves, make sure to press against your strainer to get all the flavor our after steeping. If you’re using powder (or you powderized your leaves), you won’t need to steep as long, maybe 10 minutes should be sufficient. If you don’t have hojicha tea, you’re out of luck! there’s no substitute. boo! i know… however, though this recipe would work with green, black, earl grey you’d be making a different ice cream! Whatever tea ice cream you make, just make sure to use a good quality tea. The cheap stuff tastes bitter and will affect the flavor. In order to cool your ice cream base quickly, set a temp proof bowl (i.e. metal) in a large ice water bath and stir occasionally. Another tip is to only heat up your milk mixture and keep the cream nice and cold. I used to cook both together, but found no difference in flavor or texture after leaving the cream cold and mixing in after the custard base has been finished. 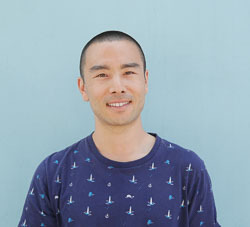 Here’s a live replay of my last episode for Japanese Cooking Live Season 2- Summer 2018! 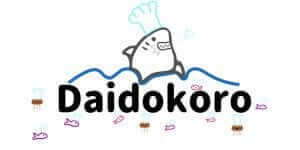 If you liked this… subscribe for new Japanese Cooking Videos! 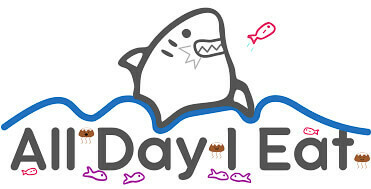 One new video each Wednesday at 6pm! What do you think? Have you tried to make any edible foods with hojicha yet? Let me know with a comment below! 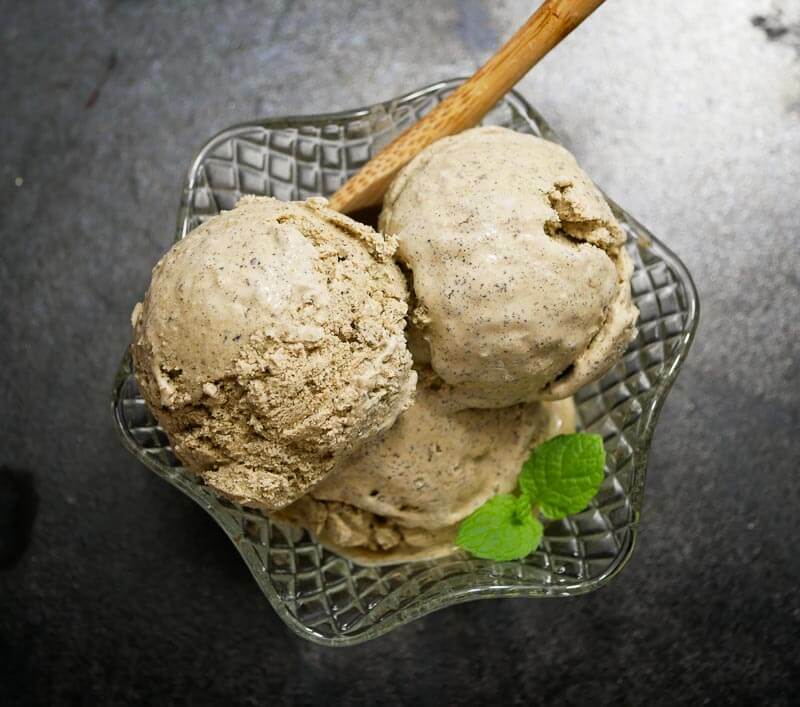 Hojicha (roasted green tea) ice cream is one of my favorite ways to enjoy the warmth of summer. 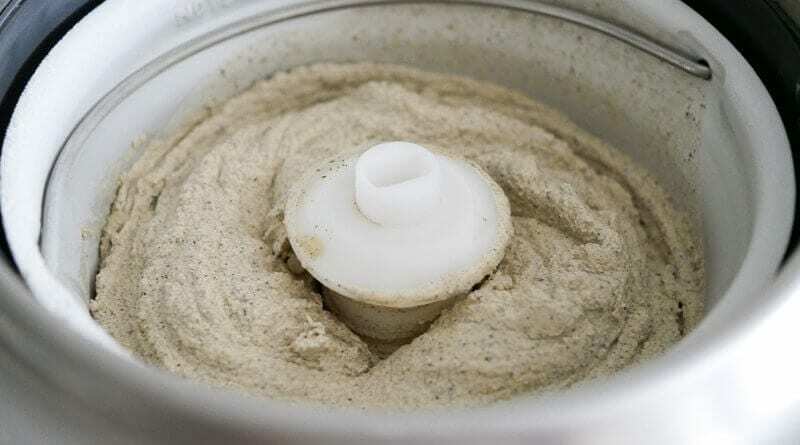 It's extremely nutty and aromatic。And because of that, the emulsified ice cream base is well-suited to carry all that flavor straight to your mouth. All you need to do is open wide!! Heat milk in a saucepan on medium low heat. Once the milk just starts to bubble, remove from heat. In a large heatproof bowl or cup, beat the egg yolks with the sugar until nice and fluffy. Gradually add about 1 cup of hot milk to the mixture while continuously whisking. Add the entire mixture back to the saucepan while whisking and heat until 165-170 degrees. Turn off heat and whisk in tea. Allow to steep (covered) at least 30 minutes if using whole leaves or 10 minutes if using powdered. After steeping, strain using a nutmilk bag for the powder or fine mesh strainer for the leaves. Add the cold cream to a heat/cold proof bowl (plastic or stainless steel) and place in an ice water bath. Stir occasionally to expedite cooling. I look forward to making this ice cream! Such great ideas. Thank you so much! thank you Megan! 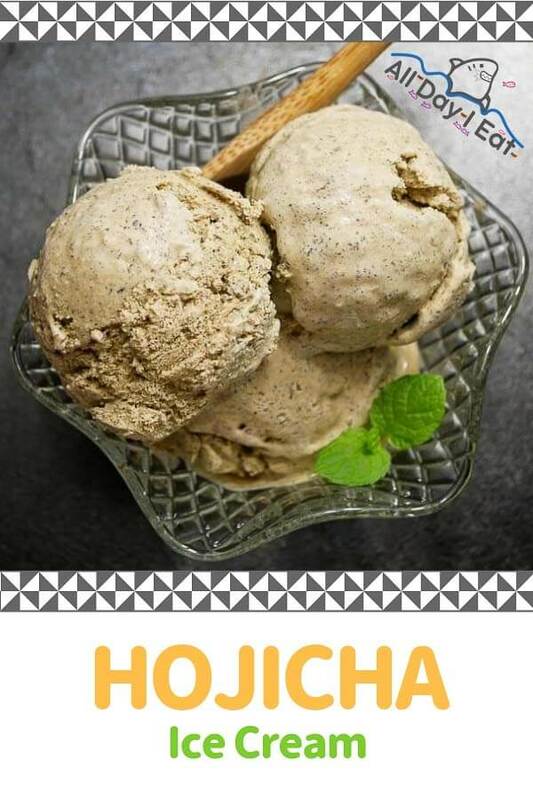 have you made hojicha ice cream before?